And how to survive the visit! We travelled to the airport on the train the night before our flight, so we would all get there together. Unfortunately, this wasn’t the best idea we had, as we then had around an eight-hour wait at the airport. We got there just before 1.00pm and were flying just before 10.00pm. We arrived in Italy sleepy-eyed and bed-headed after intermittent dozing on the plane. We then grabbed our cases and headed out in the sunshine to find a taxi. We gave the driver the address of our Airbnb apartment and off we went. TOP TIP #1: The first encounter with Italian driving quite took my breath away. It became apparent rather quickly that on Italian roads it is every driver for themselves. Horns are constantly beeping, and cars and mopeds are always squeezing between other cars. So, please wear a seatbelt. We arrived at our apartment. It was a large penthouse apartment with a stunning near-360-degree balcony, which gave the most amazing views of the city and Mount Vesuvius. Despite all feeling a bit worse for wear, we decided to go out exploring. This was, again, not a great idea, as we had little to no clue where we were. After aimlessly wandering, we went back, had a well-deserved nap and upon waking decided to once again hit the streets of an unknown city, but this time it was dark! However, much to my surprise a lovely evening was had. My friend had spotted what he thought to be a “fish and chip shop”. In hindsight, we should have been suspicious, considering we were no longer in England. We sat down in the establishment, which turned out to be a seafood restaurant (close enough). We looked at the menus, which were completely written in Italian, with bemusement. They seemed, however, to pose no issue for my friend as he began to order. With that, the chef’s special came to our table alongside a large bottle of red wine. However, after our meal of strange sea creatures (some with eyes, some without) a second round of dishes emerged… and then a third… It felt like it was endless, but nevertheless we all kept eating away at the constant stream of food. TOP TIP #2: You will see this issue of the language barrier cropping up again in this article. Be sure to download a translation app on your phone before heading to Italy, as to our surprise, little English is spoken. After a surprisingly large meal of fishy delicacies, we headed back to our apartment, stopping off for two one-euro bottles of wine. The night ended merrily with wine aplenty and full tummies: a somewhat successful first night. Our second day in Naples was again filled with aimless wandering. We had discovered a small pastry shop on our way to the metro station, which did three cannoli type treats for one euro, so naturally we took advantage of this deal each day following. We finally discovered the metro and were on our way to the Naples train station. We somehow ended up getting on a train and going to a place called Salerno. Here we again wandered, taking in the new place as well as having a dip in the sea which was next to a port that took tourists to the Amalfi coast. This gave us an idea to visit the coast later in the week. We had planned the third day. We paid a taxi driver to take us to and from Pompeii and spent two hours in the ruins. It was a scorching day and one that was rather rushed due to the time limit. Pompeii was surreal: the sights quite frankly blew my mind. From the mosaics left practically untouched on the walls of shattered houses, to the heart-wrenching sculptures of those trapped in the ash, it was truly a once in a lifetime experience. My friend also spotted a lizard, which intrigued us all for a good 10 minutes. There was also a very large tree, which we had our very tall friend pose in front of… I mean, what else was there to look at? TOP TIP #4: Try not to get too distracted by things that may not be as amazing as your other surroundings. But in our defence, both tree and lizard were pretty neat. The way back from Pompeii was slightly more terrifying than our first experience of Italian driving (i.e. it was the most terrifying thing I’ve ever experienced). I am pretty certain the guy drove the wrong way up a very busy road, and consequently we were dropped in the middle of Naples city, miles away from our apartment. Getting lost now becoming second nature, we embraced the new location and had a good look around. Here I had the best gelato I’ve ever had: it made getting stranded far more pleasant. We then stopped off at a pizza restaurant for lunch (yes, we had a lot of pizza) which topped the gelato by miles. After the trek back, we spent the night once more under the clear star-filled sky of Naples, watching the city bustle in the darkness, and of course eating more takeout pizza. Day four: possibly the most perfect day. We finally gathered our things and went to the Amalfi coast. Amalfi is the most beautiful place I have seen to date. Even the coach ride there was breath-taking (no, not because of the driving). Hugging giant cliffs, the thin roads swerved and curved around a gorgeous coast line. Upon arriving, we pondered the souvenir shops and quickly dashed to the beach (I had remembered to bring appropriate shoes this time). The time spent on the beach was a time I’ll never forget. Swimming in the sea, sunbathing, having gelato and a milkshake, seeing turtles swimming in fountains, watching street performers, and simply having the most perfect time. It was a great way to end our holiday. TOP TIP #5: Without question, get yourself to the Amalfi Coast. You won’t regret it. It was then home-time, and after four days of complete independence, we were all craving our home comforts. Myself and two friends nipped into Greggs for a pasty immediately upon landing back in Manchester. My holiday to Naples is one I will always cherish. The time spent with my friends in a fascinating and beautiful place was an amazing experience, and it is something we still reminisce about frequently. 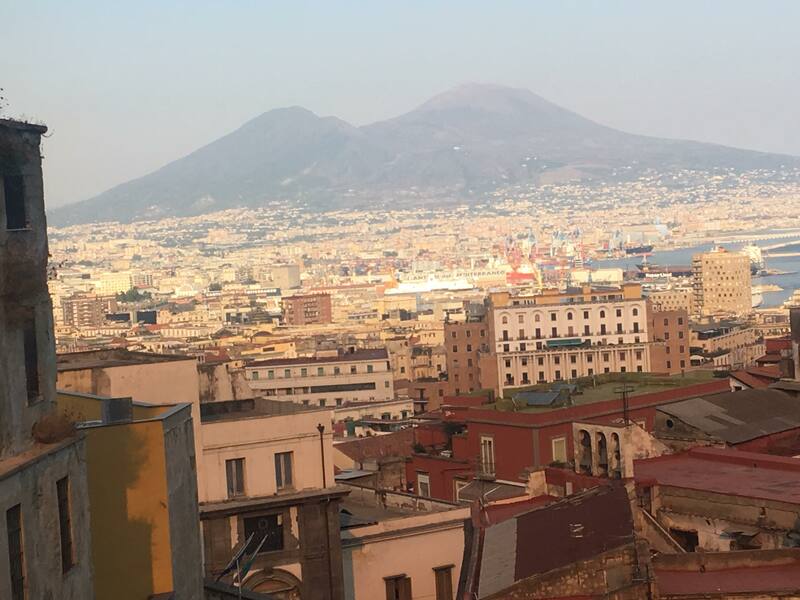 Armed with a gallery of top-quality pictures (by which I mean selfies) and a headful of memories, I’d recommend Naples to anyone considering a trip to Italy.